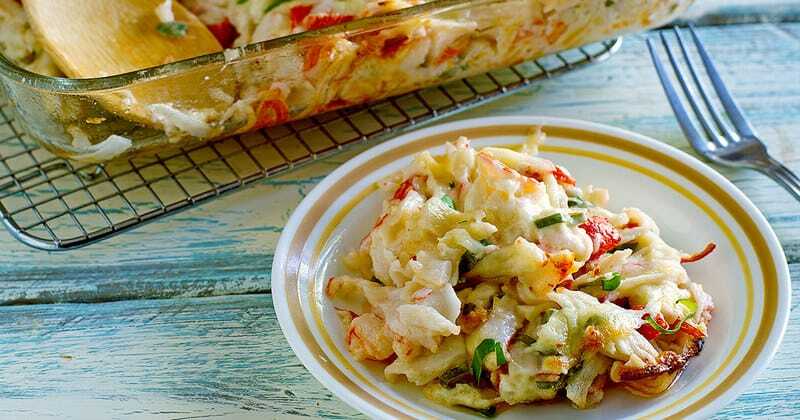 Chinese Buffet Seafood Bake is a popular dish that is served at many Chinese Buffets all over, you can recreate this dish at home. Do you love Chinese Buffets? They serve up a lot of amazing dishes. 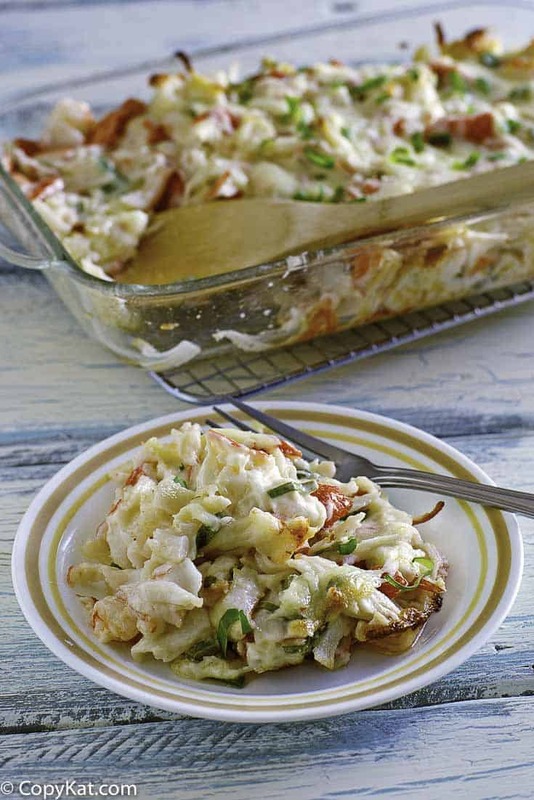 One of the favorites that I have been asked to recreate is the seafood bake. 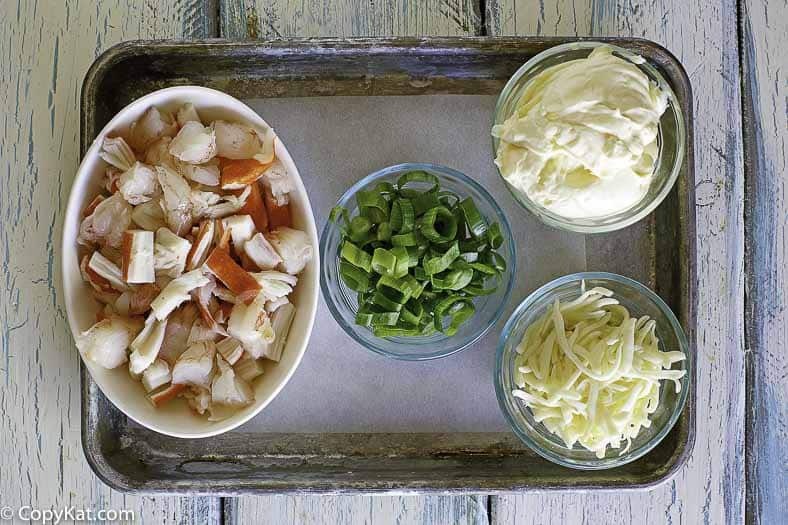 This seafood bake is super easy. It has very simple ingredients in it. Honestly, you can change the portions of the meat. I like to make mine with a large variety, but you could use just imitation crab meat if you like. For my version, I use imitation crab and lobster, but I use real shrimp. If you like you can use only the crab as many restaurants use. Also if you desire you can add additional seasonings such as a touch of garlic powder or even some white pepper. 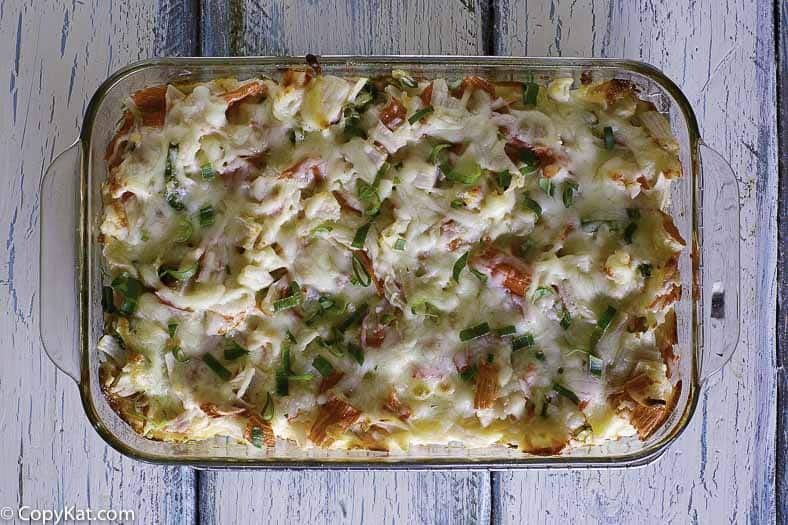 This recipe is so easy to make, you will simply stir up the ingredients together and place them in a casserole dish and pop them into the oven for about 30 minutes. So in just 30 minutes, you will have an amazing dinner for you and for your family. Do you enjoy other Chinese restaurant favorites? Be sure to check out some of these recipes. Recreate this staple of most Chinese food buffets? Preheat your oven to 350 degrees. 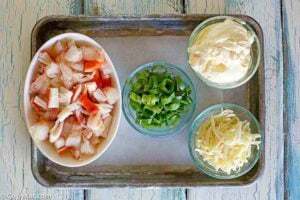 In a medium-sized bowl combine imitation crab and lobster meat. Add the shrimp and mayonnaise. Stir the ingredients well. Add the sliced green onions, and lightly stir. 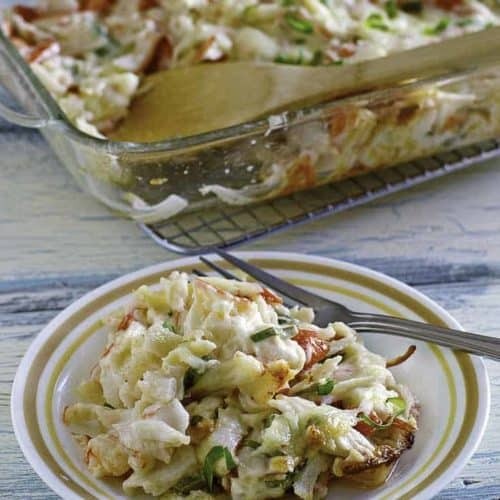 Place seafood into a 1-quart baking dish that you have sprayed with non-stick spray. Add 1/2 cup Mozzarella cheese. 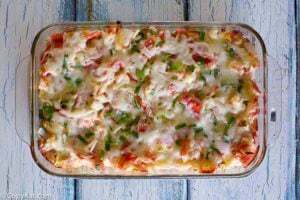 Bake for 25 to 30 minutes. I doubled this recipe for our group watching the Georgia vs Oklahoma Rose Bowl game yesterday. It was eaten first until it was gone and then the group went on to something else to eat. That tells you right there how good it was. I did add a couple tea of minced garlic from your suggestion. GO DAWGS BEAT THE RED ELEPHANTS NEXT WEEKEND. I am glad you liked it. This has always been really popular at the local seafood buffet. Mayonnaise cooks up very well. I made this for Christmas for my family yesterday. Everyone loved it and it was gone the next day! I have another huge batch cooking in the oven right now. I love the simplicity of ingredients. I did add a bag of extra small precooked shrimp. Thank you for this recipe. am curious about this recipe, I have never seen this on a buffet here in south Florida! So I looked around the internet and i found a lot of recipes for this! But all have many more ingredients, onion, worchestershire, garlic, cream cheese, cheddar, etc. !I’m wanting to try yours, but it only has mayo?? Well, cheese on top and scallions, but that’s it? That’s it. Mayo does magical things when cooked. This is what they make local in the Houston area, I am sure other areas may do different things. i have never seen this with cheddar cheese, onions, or Worcestershire sauce. Garlic would be a nice addition. It tastes just like the buffet kind which is what wanted , not with all the other ingredients thanks ! Thank you for asking, I am sorry I do not have these at this time. Can you please recreate Shrimp with lobster sauce? Can you please, please recreate Banquet Chicken or Turkey Pot pie? I have tried and simply cannon figure it out. I make a lot of different ones but, none are what I love. What makes Banquet special to you? It is the taste. There is something about the creaminess of it. I have loved it since the ’50’s. I try to keep a couple in the freezer for my quick lunches. I do remove the English Peas since I can’t handle them but, the potatoes, carrots, chicken/turkey chunks and gravy inside that double crust is for me, perfect. I have noticed they are not very full any longer but, I still love them. Mom and my brother both make their versions but, they are not the same to me. There is something special about the gravy/sauce. I think its a milk gravy with corn starch and chicken broth. ive made it before with an olive oil based crust. very similar.